Receive a lesson from Paarthurnax. Learn the Word of Power from Paarthurnax. Use your "Fire Breath" shout on Paarthurnax. With the information about Alduin's defeat learned at Sky Haven Temple, travel to High Hrothgar to meet with the Greybeards. When you arrive tell Arngeir that you need to learn the shout used to defeat Alduin. He will be quite shocked and ask where you learned about such a shout. While the Greybeards and the Blades do not have a history of cooperation, if you refuse to tell Arngeir where you came across the information, he will not help you. You can either tell him that you learned it from Alduin's Wall or that you were talking to the Blades. In either case, he will be strongly offended so it is best to placate, rather than provoke him here with your responses. Depending on those responses Einarth may chastise Arngeir for his impertinence by saying, "Arngeir. Rek/Rok los Dovahkiin, Strundu'ul. Rek/Rok fen tinvaak Paarthurnax." meaning, "Arngeir. She/He is Dovahkiin, Stormcrown. She/He will speak (with) Paarthurnax". Arngeir offers a hasty apology and tells you that the shout used to end Alduin's reign of terror is called Dragonrend. However, Arngeir cannot teach it to you as he does not know it and the origins have been lost. If asked Arngeir will explain that the shout was created during the terrifying reign of the dragons and is a shout of pure evil, embodying all the cruelty, fear and horror of the time. If you want to learn this shout, you must speak with Paarthurnax, the leader of their order. 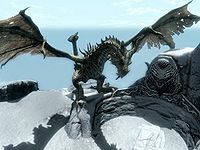 Further questioning reveals that Paarthurnax lives in seclusion at the peak of the Throat of the World and surpasses all of the Greybeards in the Way of the Voice. Arngeir will offer to help you reach Paarthurnax and leads you out into the courtyard where you will be taught all three words of the shout Clear Skies. You are now ready to attempt the trek up to the summit of the Throat of the World. The path up is blocked by magical winds dealing severe frost damage, even with resist frost effects. Use the shout Arngeir gave you to clear away the damaging mists. When you reach the summit, a dragon approaches. However, resist the urge to attack, as the dragon will land and address you: "Drem Yol Lok. Greetings, wunduniik. I am Paarthurnax. Who are you? What brings you to my strunmah ... my mountain?" After you explain your objective, Paarthurnax will respond: "Drem. Patience. There are formalities that must be observed, at the first meeting of two of the dov. By long tradition, the elder speaks first. Hear my Thu'um! Feel it in your bones. Match it, if you are Dovahkiin!" He will then shoot a bout of flame onto a wall and encourage you to participate in "tinvaak" (loosely translated, "conversation"). Inspect the word he left behind to learn a new Shout, and Paarthurnax will grant you his knowledge of it, saying "A gift, Dovahkiin. Yol. Understand Fire as the dov do. Now, show me what you can do. Greet me not as mortal, but as dovah!" Use this new shout on Paarthurnax. He will agree with the opinions voiced by Greybeards that "the dragonblood runs strong in you", even if you are a "joor" (mortal), and offer to answer your questions. After the formalities, ask Paarthurnax about Dragonrend. He will admit that he was expecting this, as "Alduin and Dovahkiin return together". Though he doesn't know the shout, he believes it could be learned by returning to the beginning of the "Tiid-Ahraan", the Time-Wound on the Throat of the World. An Elder Scroll, or "Kel" would be necessary to activate the portal and allow you to view the first Tongues using the Thu'um to defeat Alduin. As the quest ends, the dragon admits he has no idea where to find an Elder Scroll. Your quest log suggests you talk to Arngeir, or alternatively, you can speak to Esbern for more information. If you have already acquired an Elder Scroll by completing the Discerning the Transmundane quest, Paarthurnax urges you to the Time-Wound, and the quest Alduin's Bane begins. You can use the Become Ethereal shout to stroll through the mist, except for the first cloud of mist; passage through it requires Clear Skies. If you unlock the word yourself at just the right time, before Paarthurnax gives you his "understanding", he will teach you the second word for Fire Breath instead of the first (or the third if you started out knowing the second). Paarthurnax will say that he is teaching you Yol, no matter which Word the wall actually teaches you. It is possible to climb to the very top without going through the temple and the barriers. Paarthurnax and your follower may become hostile towards each other. In addition to the possibility of harming your follower, this may also prevent you from talking to Paarthurnax. This normally can be avoided if you have your weapons sheathed prior to entering the area. force Force Without Effort You stagger 25% less and foes stagger 25% more. Augments power attacks and Unrelenting Force shout. fade Eternal Spirit While Ethereal, you recover health 25% faster. Only active and visible on Active Effects menu when using Become Ethereal shout. fire The Fire Within Fire Breath shout deals 25% more damage. These increase the respective shout capabilities. You can only have one active at a time. You may be unable to learn the Clear Skies shout. Reloading a save from before talking to Arngeir then following him outside immediately will usually fix the problem. Sometimes it is necessary to watch him whisper to words on the ground to ensure they stay lit. If you leave before shouting Fire Breath, your shouts' cooldowns will recharge completely every few seconds. This exploit allows you to use powerful shouts very frequently, which will have an unbalancing effect on the game. ? As you talk to Paarthurnax, he may fly up high, above the mountain, and begin circling. You may continue your conversation, though you cannot hear him, so it is advised you turn subtitles on. This does not otherwise impede the progress of the quest. The word wall may not activate properly. If you come back later, the word may be highlighted, but you can no longer learn the word from it. In the Console, enter teachword 20e17 to unlock the first word. If you already have one or two words of Fire Breath, use 20e18 or 20e19, respectively. 10 With Esbern's help, I've deciphered Alduin's Wall in Sky Haven Temple. It revealed that Alduin was defeated in ancient times by a Shout of some kind. Maybe the Greybeards can teach me this Shout, or at least tell me how I can learn it. 60 With Esbern's help, I've deciphered Alduin's Wall in Sky Haven Temple. It revealed that Alduin was defeated in ancient times by a Shout of some kind. Arngeir knew the name of the Shout, "Dragonrend", but could not teach it to me. However, he has agreed to show me the way to reach Paarthurnax, the Greybeards' leader, who lives at the top of the Throat of the World. Arngeir says that Paarthurnax is the only one who may know this Dragonrend Shout. 100 With Esbern's help, I've deciphered Alduin's Wall in Sky Haven Temple. It revealed that Alduin was defeated in ancient times by a Shout of some kind. Arngeir sent me to talk to Paarthurnax, who he said was the only one who might know this Dragonrend Shout. It turns out that Paarthurnax is actually a dragon. 200 Finishes quest With Esbern's help, I've deciphered Alduin's Wall in Sky Haven Temple. It revealed that Alduin was defeated in ancient times by a Shout of some kind. Arngeir sent me to talk to Paarthurnax, the Greybeards' leader, who turned out to be a dragon. Paarthurnax didn't know the Dragonrend Shout, but believes that there's a way for me to learn it from the ancient heroes who used it against Alduin. The following empty quest stages were omitted from the table: 0, 1, 20, 30, 35, 40, 50, 55, 65, 66, 67, 71, 72, 80, 81, 82, 85, 86, 95, 110, 125, 130, 150, 180, 190, 195, 205, 210, 220. On the PC, it is possible to use the console to advance through the quest by entering setstage MQ204 stage, where stage is the number of the stage you wish to complete. It is not possible to un-complete (i.e. go back) quest stages, but it is possible to clear all stages of the quest using resetquest MQ204. This page was last modified on 13 April 2019, at 19:54.